Don’t you just hate rewinding DVDs? Who doesn’t. It’s about time someone invented a way to rewind DVDs. And a stylish one at that. At first glance you make think that the aptly named DVD Rewinder looks like a Teenage Mutant Ninja Turtle hot pot… but it’s not. Here’s how it works. Just snap a disc on the DVD Rewinder, press the button and watch in wonder as your disc spins in reverse thanks to the “Centripetal Velocity Spindle.” To complete the illusion, the DVD Rewinder plays a “rewind” sound while it spin discs backwards. You can also record your own “rewind” sound which provides unending possibilities for trickery. In all seriousness, my friend’s wife just found out that you don’t actually have to rewind DVDs. So chances are you’ll be able to fool a few people with this gag gadget. So show this to your less-technical friends, sit back and enjoy the show. Batteries not included. 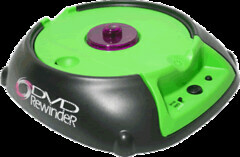 Yes the DVD Rewinder is a real product and can be purchased from dvdrewinder.com.